Upgrade to Sage CRM 7.2! Sage CRM 7.2, has been released for almost a year now. If you’re a business owner or an IT manager who rely on the earlier versions of Sage CRM to facilitate your day-to-day operations, then it’s about time you look into what Sage CRM 7.2 has to offer. This latest offering from Sage gives your organisation the edge to be able to communicate with your customers through mobility, social media and business collaboration. In today’s blog, I’ll be walking you through a detailed procedure on how you can upgrade to the latest version of Sage CRM, version 7.2, and enjoy its new features. So, let’s get going! Sage has released three hot-fixes since the release of Sage CRM 7.2 (b, c, d). Sage CRM 7.2d can be upgraded from 7.1 / SP1 / SP2. For any earlier version, it has to be first upgraded to 7.1. It is recommended to upgrade from 7.1 to SP1, and then to SP2 before upgrading to 7.2. Before performing the upgrade, it is very essential that you build a test environment to mirror your production environment. This will enable you to test the upgrade in a controlled manner and also inform you about the possible issues that you may encounter during the live upgrade, in advance. System Requirements: You can refer to Sage CRM 7.2’s software support matrix to understand the server, client and integration platform which Sage CRM 7.2 will support. License Key: The license key for version 7.2 can be acquired from Sage. Hot-Fixes: The hot-fixes (b, c, d) can be downloaded from the Sage portal. Server: If the existing production server does not match with the server requirements of version 7.2, then it’s recommended to prepare a new server before the upgrade. Once you have the above things ready, it’s time to build a test server on which you will be performing a test upgrade. So let me brief you about one of the ways you can build one. Hyper-V is Windows Server virtualization platform that is included as a role of Windows Server 2008 and 2012. It’s a cool technology, in which you can create multiple snapshots of your software installations (virtual machines), thus enabling you to build your test environment incrementally. You can begin with installing the server operating system, database, and Sage CRM similar to the versions you have on your production environment. Following this, you can upgrade the Sage CRM to the desired version by running the correct service packs and patches. You can divide the above installation in the form of ‘snapshots’ that allows you to revert back to the previous installation in case something goes wrong. 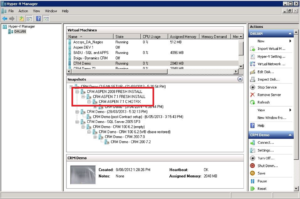 Following is a screen shot of a Hyper-V interface. Creating virtual machines and snapshots in Hyper-V demands a separate space of its own, and I plan to write a small blog-tutorial on that very soon! Backup the live database, registry, program files of the existing CRM system, and copy them in an accessible location on your virtual machine. 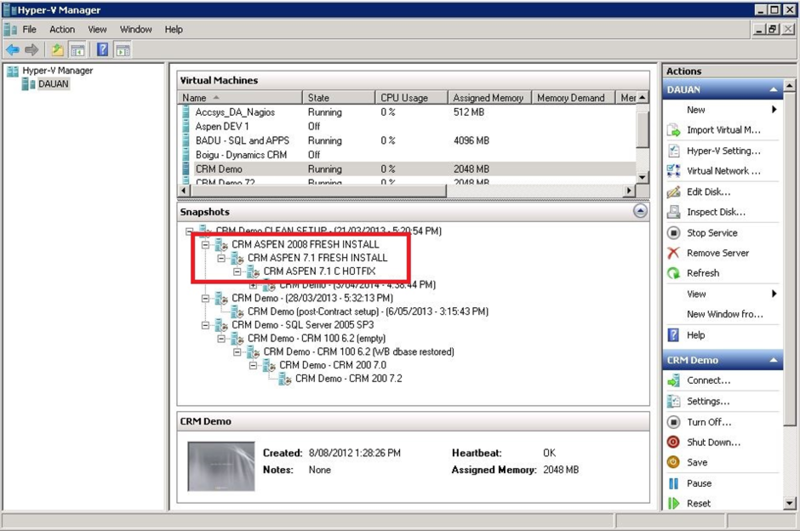 Install the existing version of Sage CRM on the test server. Copy the backup program files (custom page folder etc.) to the relevant folder in the test environment. Test the data, functions, reports and customisations in the test CRM system. Change some fields in the Custom_SysParams table of the CRM database as required. Upgrade to 7.1 / SP1 / SP2 if the current version is earlier than 7.1 and test the upgrade. Upgrade to 7.2 from 7.1 SP2 and test the upgrade. Outlook plugin may be applied to the client workstations as required. It will be easier to test an exchange integration if the exchange server is on a local domain network. If it’s hosted outside, then you will have to liaise with your system administrator for SMTP access. The procedure for performing a live upgrade is very similar to the test upgrade. Performing a test upgrade helps you to know the possible errors and corresponding solutions you might encounter during the live upgrade. Hence, I will highly recommend you to document the whole test upgrade process and use it as a guide during your live upgrade. You must be also very mindful of the CRM down-time during the live upgrade, as it is needed by your staff for daily operations. The test upgrade should guide you well in this case. Well, with that, I’ll conclude my blog. As discussed earlier, there are many ways you can create a test environment for performing a test Sage CRM upgrade. How about sharing your thoughts about the same? Let the good ideas flow!